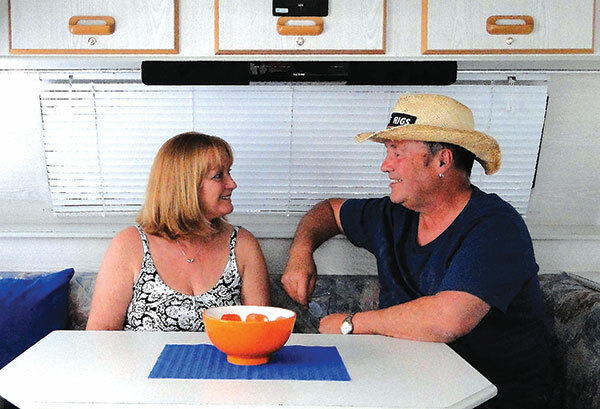 In early 2012, Graham and Rita Harsant borrowed their friends mid-80s Jayco pop-top and headed from Healesville, Vic, to the warmer climes of Narrabeen Holiday Park on Sydney’s northern beaches to see if they would like the world of caravanning. “In my other guise of ‘Kermie’, I write for a popular heavy transport publication which requires travelling to truck shows throughout Victoria,” Graham said. Arriving at Narrabeen in 28° and 80 per cent humidity, they opened the van door to be greeted by a blast of hot air. “Ten minutes later, the heavens opened up, the rain poured down, we had to zip them up again and watch the interior temperature soar. Later that year, they came across a late 90s Pedigree pop-top at the right price which met all the criteria they were looking for – a club lounge at the front, mid-kitchen, rear island bed and well within the towing limits of their Ford Territory. The first job they tackled was to remove the peeling decals on the van. After hours using a heat gun and his thumb nail, Graham resorted to a small circular wire brush on his electric drill. Along similar lines, they white enamelled the drawbar. Inside, they removed the antiquated bed lamps and replaced them with copper ship’s lights and a matching copper clock centred above the bed. “They were 12V, so we had an electrician convert them to 240V, as the van only runs the fridge and main lights on 12V,” Graham said. Graham also installed LED lighting under the cupboards around the club lounge. “Our party trick is to put them on multi-colour strobe and impress the kids in the caravan parks,” laughed Rita. Other internal modifications included replacing the curtains with venetians, a Bluetooth compatible Philips sound bar with the sub-woofer hidden in a cupboard, a sliding basket installed in the space under the nearside of the club lounge and a splashback and fridge front in blue Perspex from Bunnings. 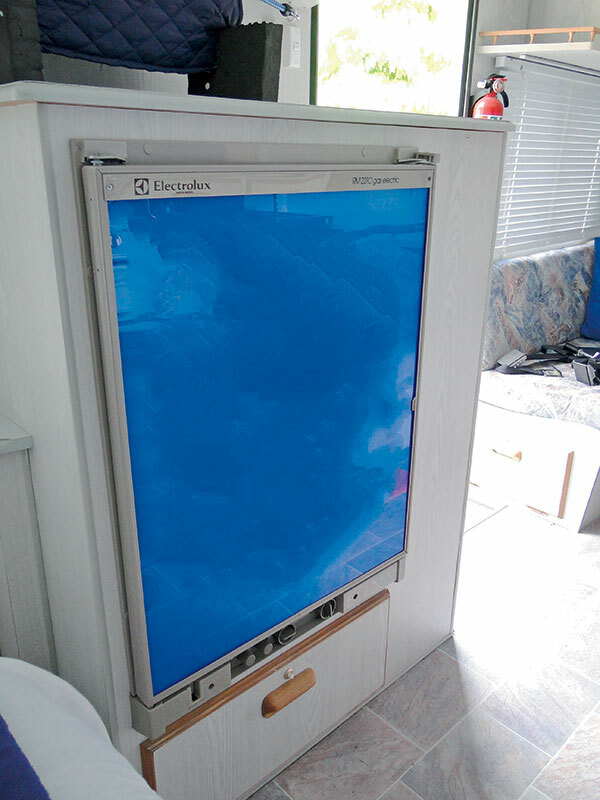 For $100, this was a cheap alternative to the splashbacks already available on the market. 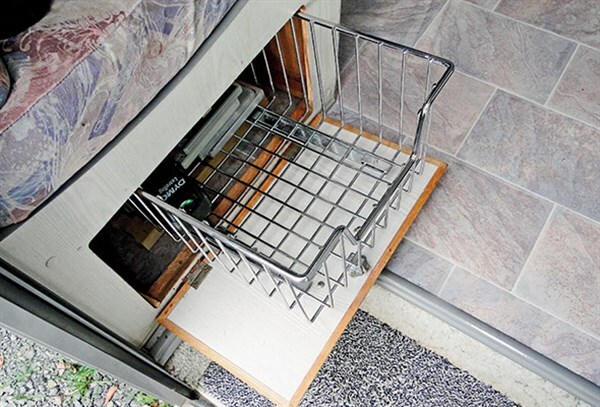 ADP Caravan Services at Kilsyth installed a hatch on the offside for $250, creating a tunnel boot under the club lounge which made that space much more user friendly. The other item installed was an under-bed air-conditioner from Denso. “It is Australian made with a two-year warranty and the outlet above the bed will blow cool air on to us at the other end of the van. We are very happy with it,” Graham said. With Rita suffering from an ongoing back injury, there were two other items of importance pertaining to the interior. One was a high quality mattress – easily achieved at a cost. The other was work space. The mid-kitchen, while they loved the layout, had very little available prep area and the adjacent table was too low for Rita to use effectively. After a bit of thought, and being horrified at the cost of an extendable post, Graham went to Aldi and purchased an adjustable bar stool for $29. The Aldi product was ideal because it didn’t have a footrest. “The base of the barstool had a rippled strengthening band around it so I bought a strip of 25x3mm aluminium, bent it into an open rectangle so that the ends would fit behind the ripple, drilled a hole through the centre and used a bolt with the same thread as the original table post to bolt it to the floor,” Graham explained. “I bought a small sheet of 3mm metal plate and screwed it to the stool shaft, where the seat would have been,” he said. 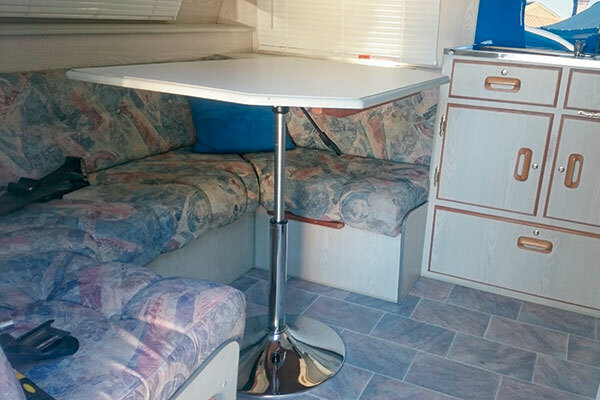 “From eBay, I obtained two ball bearing sliders and attached the original table to them. “The end result is we have a dining table that will extend to bench height and also slide backwards and forwards. With everything ship-shape, Rita’s comment about awnings for the zip windows surfaced again. “We thought it was a simple idea, but one that ended up taking four years of experimentation to come to fruition,” said Graham. “Being involved with the trucking industry, I was well aware of the strength and durability of the vinyls used for truck side curtains, so that material was a given. “The problem was how to be able to attach them to the pop-top roof and have them be self-supporting. “It has taken quite a while and many design ideas to come up with a product that is strong, safe and also easy to install, roll out and roll up. 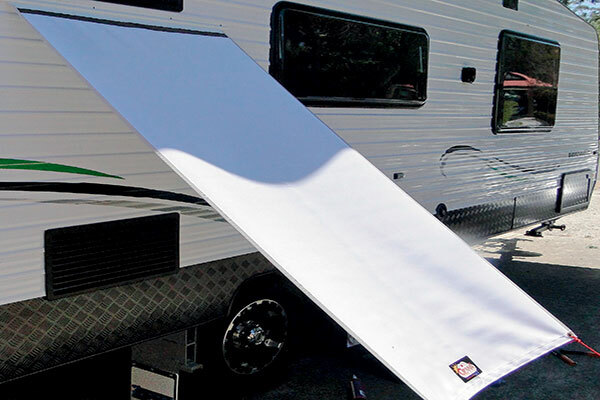 “We fitted them to our van and received a huge amount of interest from other caravanners, so we decided to take the plunge and go into manufacturing them. “We purchased an industrial sewing machine, and talked to Australian suppliers regarding the bits and pieces we needed to outsource. “We are now in production, having launched OziwA at the recent Bendigo Leisurefest. 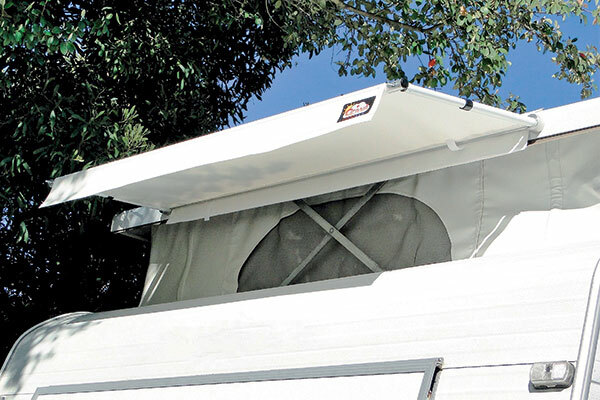 “OziwA stands for Original Zippy Window Awning and we have gained a patent for the design. “Now we just have to tell the world,” laughed Rita. 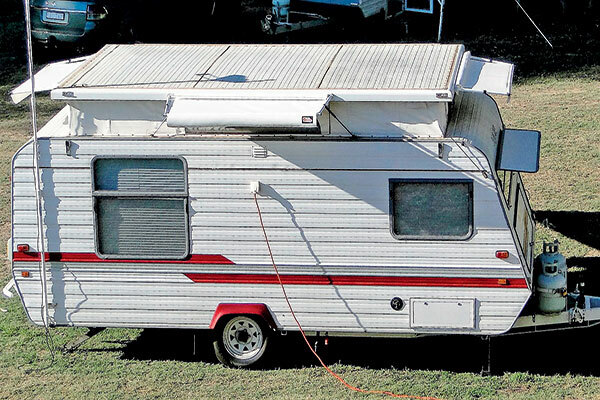 Now the Harsants have their ideal pop-top, a home-away-from-home when working the truck shows and a new business which they can work on from home or while on the road. You can find out more about OziwA at www.oziwa.com, on the OziwA Facebook page or by phoning Graham and Rita on 1300 469 492. 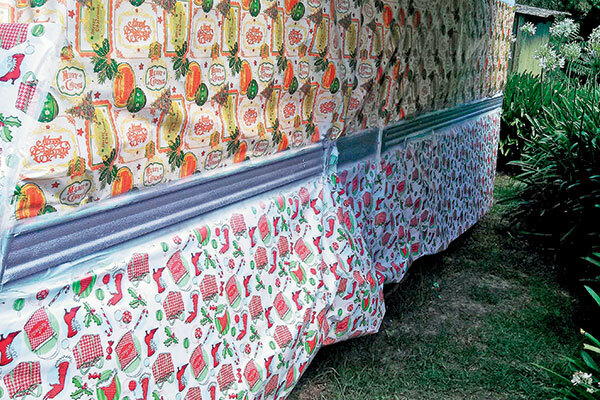 The full feature appeared in Caravan World #562. Subscribe today for the latest caravan reviews and news every month!